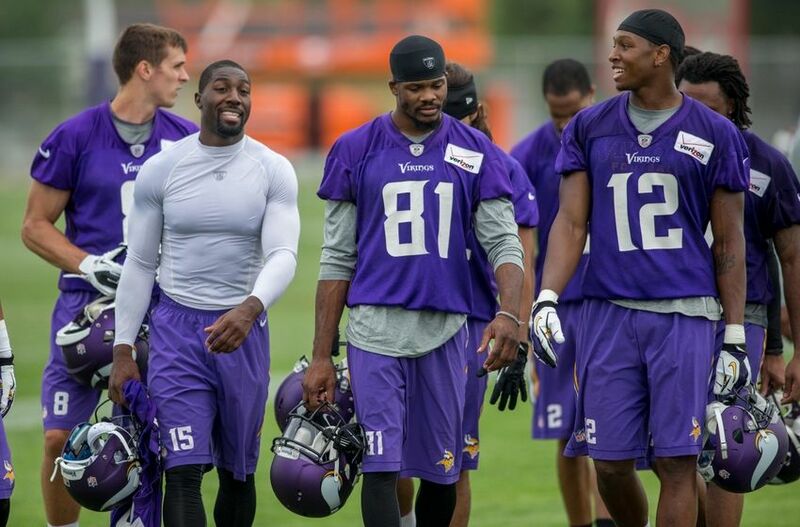 Daniel House takes a premature stab at the Vikings 53-man roster and the practice squad. Find out who he has making the team if the coaching staff made cuts today. The Vikings have just three practices left at training camp in Mankato, MN and the regular season is less than a month away. The team will head back to the Winter Park next week to continue their preparations for the 2014 season. There is certain to be players from other teams on the final 53-man roster, but I have listed the roster and practice squad as the team currently is constructed. I will update this roster several times before the team officially makes cuts at the end of this month. Analysis: We know Matt Cassel is winning the starting job at this moment and that isn't going to change any time soon. Teddy Bridgewater will spend the season developing, but if Cassel struggles, he will enter the game early in the season. The Vikings will decide to go with an emergency option such as Jerick McKinnon or Kain Colter and will release Christian Ponder. Dead money is already 'dead,' and considering the way Ponder has performed at camp, the team will decide to eat the money and keep an extra linebacker or defensive back they truly covet. Analysis: There really is no question with the top three Vikings running backs this season. Adrian Peterson is healthy and ready for the season, Matt Asiata has refined his body, and Jerick McKinnon is going to be the 'jack-of-all-trades.' The coaching staff really doesn't have a tough decision to make at this position. They may look to add a running back in free agency for the practice squad, but Banyard and Williams appear to be the odd men out. Analysis: This position is very hard for me to decide which direction the team will head. Jerome Felton is a proven veteran who is a solid run blocker and pass catcher, but Zach Line can perform the same tasks. If the team is looking ahead to the future, don't be surprised to see them part ways with Felton. I just don't see it happening and the coaching staff will try to slip Line onto the practice squad, which could be a very difficult task. NOTE: I'm assuming Simpson will be suspended and the team will keep another receiver. Analysis: The coaches like the upside Rodney Smith can provide and with his recent surge at practice, they will make a move that can help them in the future. Adam Thielen has had a great camp and can contribute on special teams, which means he is a lock to make the 53-man roster. Simpson will likely be suspended and the team can decide whether they will keep a player like Rodney Smith when the suspension has concluded. Analysis: The coaching staff is hoping that Chase Ford is ready for the start of the season, but in the event he isn't, Mike Higgins will make the team. Higgins has proven himself early in camp and has displayed great hands, along with an ability to run solid routes. Mike can slide onto the practice squad and be an option in the event injuries occur this season. Analysis: The team will have to decide whether they feel Antonio Richardson can hold up to the physical standards of the NFL. He struggled during moments of the first preseason game, but he played well enough at training camp to show he can be productive. Veteran Vlad Duccase bumps Jeff Baca off the roster and the team attempts to slide Austin Wentworth to the practice squad. Zimmer mentioned Wentworth as a player he thought looked improved during live game action on Friday night. Analysis: The defensive line is the deepest position group on the Vikings roster and the roster cuts will be very difficult at this position. In a surprise move, the Vikings like what they have in a young player like Isame Faciane and know they can't slide him onto the practice squad. In the event this occurs, the team will have to part ways with a veteran player like Tom Johnson. This is very tough after watching him practice at training camp, but Mike Zimmer likes young players he can develop into talent for the future. The coaching staff believes they can develop Shamar Stephen, but they place him onto the practice squad in an effort to keep more valuable assets. Analysis: This position is very tough to project, especially considering all the shuffling that has taken place among the linebackers. Brandon Watts is young and raw, but they are afraid they can't slide him onto the practice squad. As I discussed above, in order to keep Watts and Mike Mauti, they decide to eat the contract of Christian Ponder. The coaching staff likes the talent and depth at this position and will look to keep as much young talent as possible. Mike Mauti hasn't seen many reps lately, but his role on special teams will be one of the reasons why he just barely slides onto the roster. Analysis: The defensive backs are very hard to trim this season, which is a great problem to have. The coaching staff decides to keep seven cornerbacks and the team decides to part ways with three safeties. Kurt Coleman has had a solid camp and will likely start the season next to Harrison Smith. Robert Blanton has been injured and needs to get healthy soon if he wants to make this team. Chris Crocker was just signed and Mike Zimmer wants to keep him as a veteran presence in the backend of the secondary. Antone Exum is a player for the future and he just needs to time to develop and become more fundamentally sound with his technique. Analysis: There is no competition or questions at this position, but Jeff Locke needs to become more consistent as a punter. Can't argue with most of it, in the end they can't keep more than 53. I'm not convinced Shamar can survive the PS, and I think it's entirely possible that Crocker is released (pre-determined before he ever showed up) and Sendejo survives instead because of what he brings on STs. Mauti hasn't impressed but Dean only shows up on STs and now, lots of guys do that, so this makes sense to let him go. Do you really thing this is Reisner's last hoorah? Reisner is a fringe player. He has shown some flashes, but has been somewhat inconsistent. He just needs to have a solid preseason to make a push in the TE group.